a) you shouldn't filter comments! just delete them if they're really bad. they really hinder conversation. albeit anonymous conversation. b) for some reason the wider format makes it look like you'll be posting more frequently. maybe it's because it resembles a message board. I think things could benefit from a more coherent color scheme. Right now the black/purple/teal/gray/maroon combination doesn't go very well together. I always found the purple on black a bit harsh anyways; if you're going for a redesign, a more muted theme (I like the use of the school colors - you could use shades of rose for some of the trim) might be more aesthetically appealing. In general, using more than one shade in the same color palette makes for a subtle but visually pleasing look. (The blogspot comment dialog I'm typing in right now is a good example of this.) 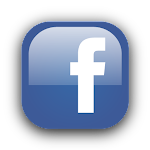 By using just widely contrasting colors your current design is a bit distracting. If you're going to have a banner header, you could use a picture of some of the Vassar scenery (we have gorgeous trees after all), sort of like on MiddBlog. The color-inverted quad picture was interesting but it got kind of old. Changing banner pictures every few weeks could also be fun. As long as I'm being picky, how about fonts besides Arial and Verdana? Just some thoughts I've had. Of course, what matters most is the content! Keep up the good work, Mads is entertaining. 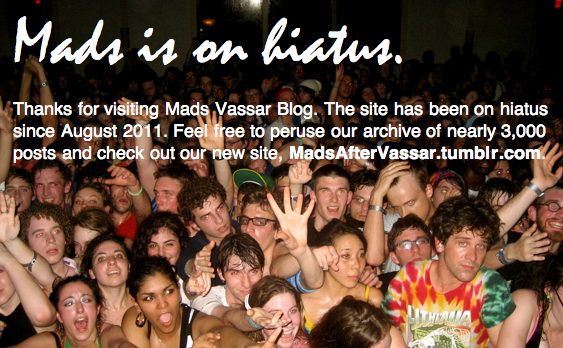 um i just freaked out because i clicked on my madsvassar bookmark and everything was different! wow, i mean seriously i was worried for a second. whew, im ok now though. change is good. i love mads!! If this is Mad's final look, gray+maroon+black+white+purple is a definite no no. I mean. So far. Not good. mads should go gray and maroon, vassar's colors. more like light grey and light pink. with a background that isn't black. Pink is no longer a "girl's" color! Vassar's original colors were rose (a dusky pink) and gray. Depending on who you ask, the maroon was either introduced to protect the manliness of male athletes, or because maroon uniforms are cheaper than pink ones. Either way, maroon isn't actually one of the school colors, despite its use instead of rose in bookstore merch and on the school website. And at graduation, the gown collars still have pink lining. There's nothing wrong with acknowledging that while Vassar is coed now, it was for the majority of its history a women's college, and a pioneering one at that! How about gray, maroon, *and* pink? They'd go well all together. i agree.. more wesleying/less blog because honestly this (give that it is written by a freshman) can sometimes be a trip down snorestown. esp with the filtering of comments. wtf? way to promote censorship you [beeep] [beeep]. (Dark gray, light gray, and dark red). Also Helvetica. I'm not a fan of the white background. It's a little boring. just copy wesleying, it's really good. do the same white background and formatting that they do. Hey there Mads. I like the maroon and grey layout- keep up the good work! I like this current two shades of grey and maroon. The way the design is right now, with the easy black on white, is much nicer than it was before with the harsh purple and black. The design is much easier on the eyes now, but the header image is ugly low quality. vassar kids are pretty html.savvy. so i recommend you stop by the cloisters in the library sometime and ask someone (LIKE ME) to help you out. ah and i should mention that the guy who started tumblr, david karp, is pretty gosh darn cute and smart. he could've gone to vassar but naturally he didn't. probably because he actually IS cute and smart.